Ian Fleming's British super spy returns in an all-new original adventure, James Bond 007: Blood Stone, that's about as unoriginal as video games get. Blood Stone is an entertaining, just good enough shooter that borrows heavily from better games. The Daniel Craig version of Ian Fleming's Bond is sent on an international manhunt to stop a bioweapon threat, an adventure that seemingly has nothing to do with diamonds, as its title might imply. Perhaps it has something to do with the appearance of singer Joss Stone, the game's Bond girl equivalent, or a cameo from a jewel encrusted knife. Regardless, Blood Stone is primarily a simple, cover-based shooter spiced up with a liberal dose of chase sequences, explosions and modern day James Bond action. 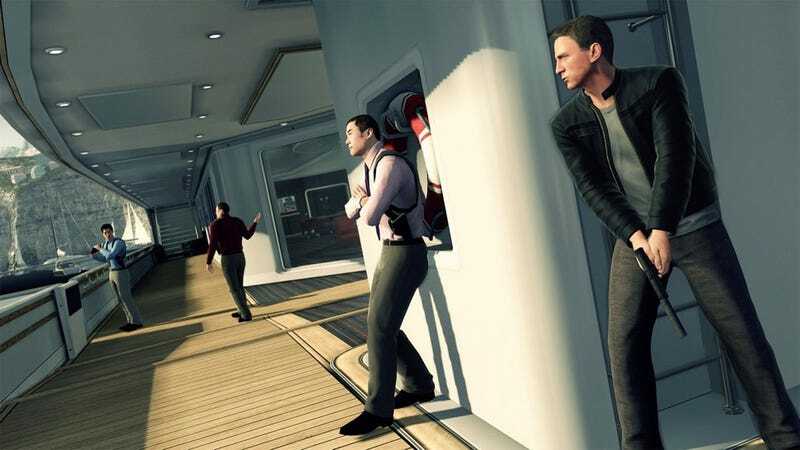 The James Bond fanatic who hasn't played games like Splinter Cell: Conviction or Batman: Arkham Asylum, two games in which Blood Stone's differentiating gameplay mechanics have been done better. This is a Bond game from Bizarre Creations, the people who make good games like Project Gotham Racing, Blur and The Club, plus great games like Geometry Wars. They have the talent to make a James Bond game good... right? What does this Bond game bring to the table? First, Blood Stone gets the flavor of modern James Bond right. It's packed with thrilling vehicle chases; it's stuffed with diverse and colorful international locations to explore; and it nails the more vicious, mostly humorless Daniel Craig version of Bond well—even if Craig's own line delivery is flat and muted. Taking down hundreds of rank and file thugs with bone cracking melee attacks or effortless head shots with the press of a button serves the Bond character well. It's quite easy, even on harder difficulty levels, underscoring Bond's super agent skills. That all sounds pretty good. What's the problem? Almost everything you've played in Blood Stone, you've played before and more capably in action games of its ilk. For example, Bond's sole gadget in Blood Stone is his smartphone, the game's take on Batman: Arkham Asylum's "Detective Mode" view. Switching on the phone alters the game's visuals, highlighting waypoints, weapons, bad guys and items that can be scanned for intel or hacked with a button pressing mini-game. The smartphone gimmick is useful, but distracting, as the screen fills with static in an attempt to restrict overuse. Any other tricks up Bond's sleeve? Yes, Bond can pull off "Focus Aim" shots in Blood Stone, which are essentially free, automatic headshots. Players can collect "Focus Aim" tokens by performing melee takedowns—which are admittedly quite fun to pull off, because watching Bond snap necks again and again is oddly entertaining—then cash them in if things get hairy. That's a mechanic lifted from Splinter Cell: Conviction, which is certainly fine, but the game's shooting is so simple and Bond so powerful in hand-to-hand combat, you'll find little real need to use "Focus Aim." It just seems pointless. James Bond will return... in the many subsequent attempts to survive this insufferable driving level that made me hate ice in video games even more. What about the driving? While Blood Stone's cover-based shooting mechanics are solid, if simple, it's surprising how little I enjoyed the game's driving sequences. Yes, they're action-packed, highly choreographed car chases through a shower of explosions and flying cars, but they can also be frustrating. There's a great sense of speed, but it never feels as if you've caught your prey, just that you've reached the end of the ride and cued up the next cut scene. One driving sequence set on ice represents Blood Stone's lowest moment, a maddening memorization of barely visible cracks in the frozen river and dozens of deaths by drowning. But this is Bond! He's been in far worse situations than Blood Stone. Despite my distaste for the driving and the copied mechanics, Blood Stone actually manages to be light fun for the six to eight hour campaign. Bizarre got the cover-based mechanics right, Richard Jacques delivers a spot on musical score and watching 007 beat the consciousness out of dumb thugs is certainly satisfying. Weapons—shotguns, SMGs, pistols, a stun gun and more—feel good, but remind the player that this Bond doesn't have much in the way of interesting gadgets. Blood Stone does a few things right, it just doesn't do much that's great. Sounds like a rental. Would the multiplayer make it worth a purchase? Absolutely not. There's only a handful of gameplay types—team deathmatch, last man standing and an objective based mode—but multiplayer feels like a tacked-on, technically iffy addition that's not worth your time. James Bond 007: Blood Stone is good enough to keep players entertained for a few hours, but does little to make it worth a purchase over much better games that don't have the benefit of the Bond license. Bizarre Creations and Activision have invested heavily in everything else not gameplay related, with nice looking action-packed set pieces, diverse environments, and quality contributions from Bond film talent. There are a few standout moments in Blood Stone, but too much of it you've seen before, better. James Bond 007: Blood Stone was developed by Bizarre Creations and published by Activision for the PlayStation 3, PC and Xbox 360, released on November 2. Retails for $59.99 USD. A copy of the game was given to us by the publisher for reviewing purposes. Played single-player game to completion on Xbox 360 on Agent (hard) difficulty. Played 15 matches of online multiplayer over Xbox Live.